Jesse Thorn visits Carl Goldberg, owner of CEGO Custom Shirtmaker in New York City, to learn the difference between a custom shirt and an off-the-rack shirt. Then it's off to Alan Flusser Custom in New York for a visit with the proprietor, a menswear legend. Flusser offers some tips on dressing for your body with the help of three associated of Put This On. Finally, a visit with Ryu Kwangeol at Pro Tailor in Los Angeles to answer a viewer's question about altering off-the-rack dress shirts. Our favorite custom shirt shop, CEGO, has teamed up for a very unique sample sale in Manhattan. Our favorite custom shirt shop, CEGO, has teamed up with one of our favorite eBay sellers for a very unique sample sale in Manhattan. 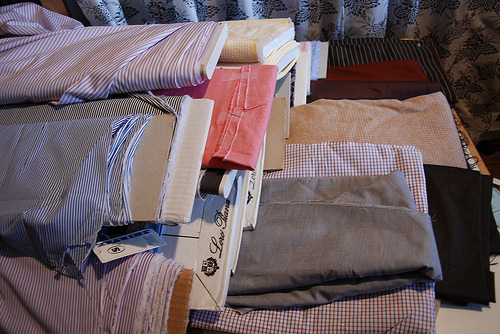 Aaron obtained the stock of Alan Flusser’s custom shop when it changed management, and is offering a sale of sample goods and fabrics from the store. The goods will pretty much run the gamut, and Aaron assures me there’s lots of good stuff. Of special note to people who wear the sample jacket size of the show, 41L. (Like me, dammit, all the way out here in LA.) You can check out photos here. Carl from CEGO tells me they’ll be offering a special $100 labor rate if you buy shirting fabric from Aaron, and some of CEGOs fabrics will be on sale as well.